Tea enthusiasts know that the flavor and taste of loose leaves tea is unique and can’t be found in tea bags. Recently, the practice of using tea infusers for brewing tea is on the rise. For brewing your tea with loose leaves, you need a tea infuser. Kettles that include tea infusers are a bonus for those tea lovers who like to brew their tea with loose leaves. Let’s take a look at what is an infuser first. What is a Tea Infuser? They are spacious enough to let the tea leaves float that helps in brewing the strong flavor out of them. They are also very popular. Shaped like a ball, these mesh and metal tea infusers are compact and easy to use. But they seem to have smaller space inside for leaves to move around in boiling water. You may not get the right amount of flavor through these tea infusers. They also come with chains so that removing them out of tea become easy. They work pretty much same like metal balls. Again don’t have much space for tea leaves to move around freely and may not extract the exact flavor out. These tea infusers may also leave a small taste of silicon in your tea. Travel mugs are also handy. But they are suitable for traveling and only for one or two cups of tea. Seeing the love of tea lovers for loose leaves tea, the manufacturers have come up with the solution and designed special kettles that include tea infusers. These kettles are just like other kettles with the added benefit of having a tea infuser to extract the maximum flavor out of leaves. We all know that the flavor and taste of loose tea leaves can’t be found in bags and adding loose leaves in kettles seems messy as you still have to use a strainer for removing the leaves. The kettle with tea infuser offers great convenience for tea lovers. Not to mention these infusers are removable and thus does not restrict your kettle only for teas. You can still get warm water for different other uses like making coffee, or instant soups, or anything you fancy. There are certain things to consider while buying a kettle with tea infusers. We have noted these down for your convenience. The first thing you want for your tea infuser is to be spacious enough to allow the tea leaves to move around somewhat so that their real flavor and taste is fully extracted. Too small infusers may not serve the purpose. The removable infuser will be easy to clean, and you can also use the kettle for other drinks like coffee. The mesh of your tea infuser should be fine enough to not to allow any small leaves out of the mesh. Choose the kettle that suits your needs. 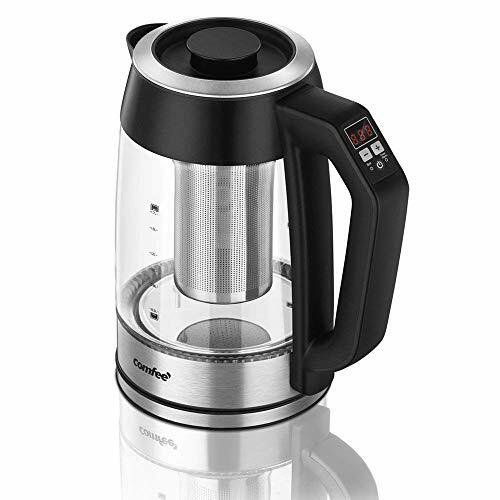 If you have a large family and need the kettle to cater all their needs then certainly it should have more capacity. On the other hand, if you need a small kettle beside your desk just for having a cup or two of tea, then you don’t need to buy a kettle with more space. Temperature control is a very useful option as it allows you to brew your tea or coffee on the exact temperature. Different teas and coffee, all need different temperatures for extracting their maximum flavor. Overheating or boiling may change their delicate flavor or make them bitter. Auto shutoff and other useful features. 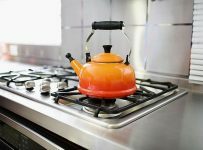 Auto shutoff is a very convenient option for those who get busy in other household chores after turning on their kettle. With this feature, kettle automatically shutoff when water reaches your desired temperature and prevent water from over-heating or even drying out. Many other features make your life easy like timers, keeping your water warm for some time. 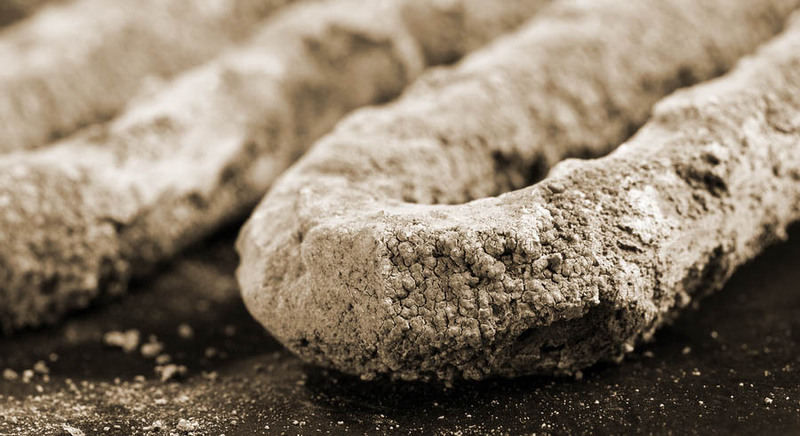 If you are living in an area of hard water, your kettle can have a firm coating of limescale inside which not only looks bad but affect the taste of your drink and the performance of your kettle. For enhancing the life of your kettle it is better to use one with a filter. For preventing any limescale buildup, you need to clean your kettle from inside with vinegar, lemon juice, or baking soda. The opening of your kettle should be wide enough to allow your hand inside so that you can scrub any mineral traces or residues from inside. A kettle with removable lid will be more convenient to clean. 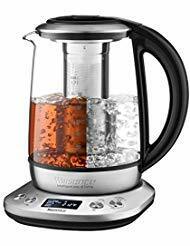 If you are thinking of buying a new kettle and also love tea, so it is a better idea to buy one that comes with tea infusers. 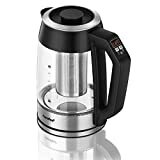 We have enlisted below some of the best electric kettles with tea infusers for your convenience. Take a look as you are surely going to find the one here that cater your all needs. This one comes with a digital control handle from where you can set your desired temperature. The glass kettle looks elegant, and you can take the pleasure of watching your tea while brewing. The top lid is removable for easy cleaning. It has 1.7 capacity to cater to the needs of the whole family. With its 360 degrees, swivel lifting and pouring is easy for both left and right-hand users. 2. Comes with a removable tea infuser. 4. Removable lid for convenient cleaning. 5. Cool touch handle prevents burning of hands. 1. The kettle is a bit heavy. 2. Doesn’t come with a filter. This one is really efficient as it boils water within seconds with its powerful motor. It gives a precise temperature. 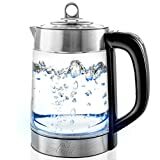 The jug is made of glass with a stainless steel handle base and lid. Its ergonomic stay-cool hands are designed for comfortable grip. The auto shutoff system prevents over boiling. The kettle comes with a tea infuser for extracting the maximum flavor out of your tea leaves. 1. Classy look with glass and stainless steel design. 2. Easy and comfortable grip. 1. Needs extra care for glass. 2. No filter for preventing limescale. 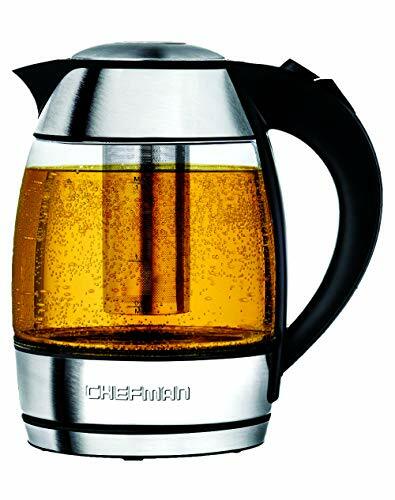 This kettle is another elegant piece with the capacity of 1.8 liters. Its clear Borosilicate Glass & Brushed Silver Stainless Steel design makes this kettle unique. 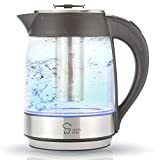 The kettle has automatic boil dry protection and shut off when water is heated. 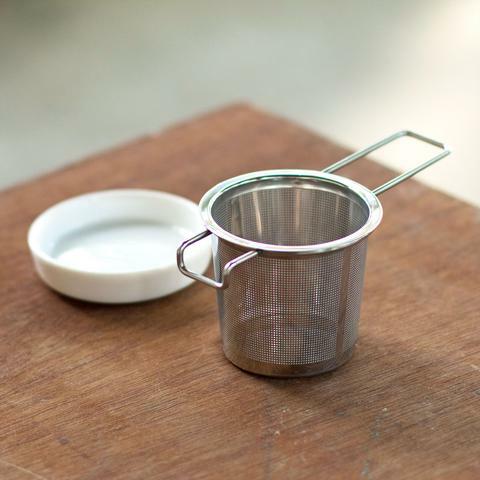 The Kettle is easy to clean and comes with a tea infuser that is easily washable and removable. It also comes with one year warranty. 1. Spacious enough to cater to the need of a large family. 3. Tea infuser for extracting the true flavor of tea leaves. 4. 360 degrees swivel base for easy handling, lifting and pouring. 1. Need extra care due to the glass. 2. No filter for the hard water problem. 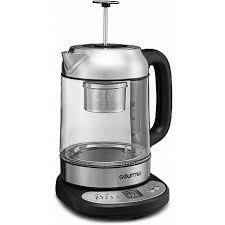 This electric kettle by Willsence is another great option for tea and coffee lovers. It comes with all the features that you need in a modern kettle. The kettle has a unique design and looks beautiful resting on its stainless steel base. It comes with easy to install and remove tea infuser. With its child lock feature, you don’t have to worry at all if you have kids around. Its boil dry protection prevents any overheating and kettle automatically shuts off. Removable lid makes cleaning from inside convenient. 2. Comes with a tea infuser. 4. Boil dry protection and auto shut off the system. 5. Six preset temperature settings. 1. No filter for hard water. The last one in our list is another classic kettle that makes a statement resting on your table. It includes all the features that you would want in your kettle. The glass and stainless steel design give it a perfect look. With its precise temperature control, you can rest assured that your drink comes out rich in all its flavor. A special tea infuser is easy to install or remove. The double wall protection gives a cool exterior even when water is boiling inside. 1. Comes with a filter for preventing scale buildup. 2. Precise temperature control and 10 preset temperatures. 1. A little bit heavy because of Glass structure.